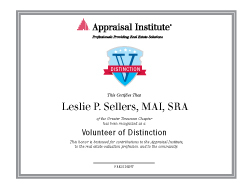 Any AI professional in good standing who makes contributions to the Appraisal Institute, the appraisal profession or their local community is eligible to be recognized. Chapter executive directors submit nominations, on a form provided on the Appraisal Institute’s website, to their region executive director. Any AI professional may make suggestions to chapter executive directors. Region executive directors, in consultation as necessary with their region chair and/or vice chair, select honorees each month for their regions. Regional nominations should be sent to Brent Roberts, broberts@appraisalinstitute.org.